I was sitting in my car waiting for a friend to finish shopping at the Spanaway Wal-Mart today, I heard singing. As I looked around, all I could see was a man at a table in front of the store and another offering a Tacoma newspapers to passers-by. I emerged from my car with a business card for the post and wandered over. Sure enough, the man at the table was wearing a microphone and singing a lovely old tune from the 1950’s. He was a silver-haired African-American man, his baseball cap emblazoned with a Vietnam Veterans emblem. 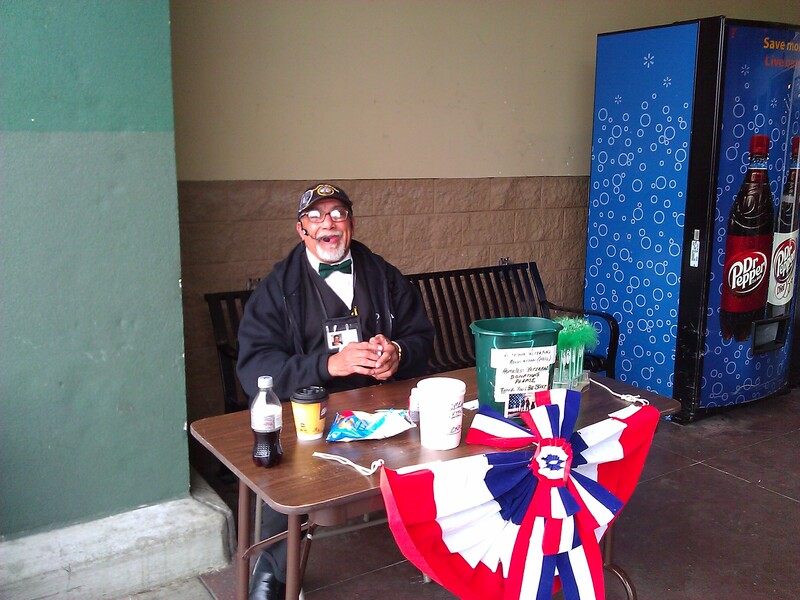 His table had a couple containers, a large bow and a sign asking folks to help homeless Vietnam Veterans. For a $5 contribution, you could get a green feathery shamrock pen, since it was St. Patrick’s Day. His name was David “Davio” Ritchie and he lives in Yelm. His business card says he sang with the Belvederes. He said he toured all over the south from 1955 to 1962 and sang as the opening act for Ike and Tina Turner, the Shirelles, the Ronnettes and others. Searching on the Internet there is a video of him also admitting he is a cousin of Lionel Ritchie. He was born in Erie, Pennsylvania and played football, basketball, baseball was on the track team. He tells of getting a degree in mortuary science in 1962 and became and army medic. In 1967-68, he was sent to a tour in Vietnam at the height of protests against the war back home. He fought in the Iron Triangle, jumping from helicopters to aid inured troops. He told of returning from the war to Erie, Pennsylvania. Walking down the street with his mother a couple weeks after his return to the states, he heard a loud siren and immediately dove to the sidewalk. It was an instinctive move that broke his nose. His mother was puzzled and asked what was wrong with him. Following that, he went through a period of self medication and 8 months of homelessness, living in a local dumpster. He explains the importance of giving war zone soldiers time to reintroduce themselves to civilian life. He felt six months of this kind of reverse training would have been extremely useful for him and others. As he spoke, passers-by dropped dollar bills into the jar and he thanked them. 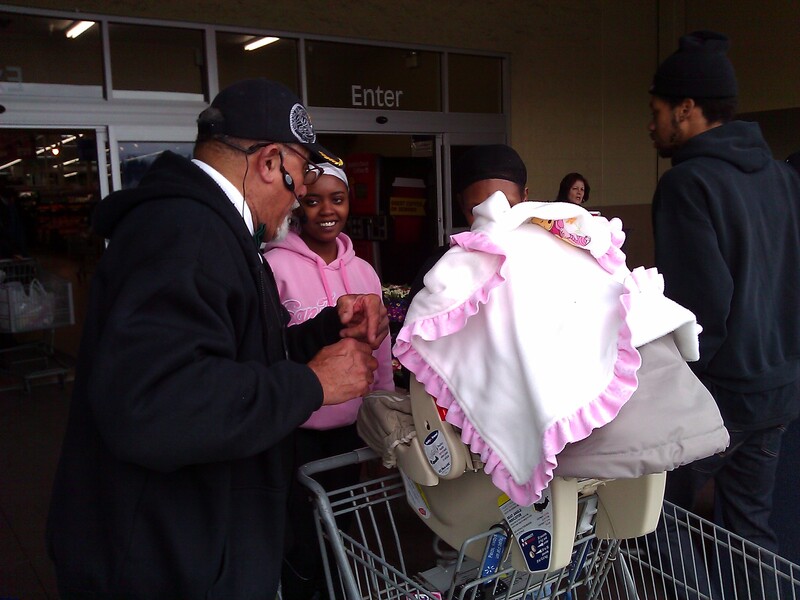 When a young mother and her friend pushed their shopping cart past with a baby carrier perched on top, he stopped them. “How old is the baby?” he asked. “May I see it?” The mother flipped up the blanket and he gushed over the one month old baby girl. He complimented and thanked them as they went on their way, briefly breaking into a stanza of another song. Davio is a father of 9, grandfather of 11 and has 1 great-grandchild. He failed to mention whether any of them also sing so well. He did note that his life experience had everything to do with why he wants to help the homeless. Davio set out on a spiritual mission several years ago, researching over 150 texts for origins of people and religion, seeking to find an explanation for the spiritual connection between us all. He pulled out a manuscript of which he says he has sold about 30 copies. It is called, The Origin of Things. To research the book he read many texts, some in their original languages. He travelled to eastern Africa to understand this birthplace of hominins as part of his research. On the back is a full-page photo of Davio wearing an Ethiopian tribal hat that belonged to his mother. A couple came by with two young children. Mom gave them each a dollar to put in the bucket themselves. Dad dropped in a twenty. Sweet man I’ve seen him a time or two has a lovely voice and such a nice person. Davio (David Ritchie) was killed in an automobile crash outside Olympia Washington, December 5, 2014. He will be missed by his family, fellow veterans and many others who knew him. So sorry to hear this. Thank you for the news. He was a fascinating, outgoing and talented man. He was an old friend of mine. So sad to hear of his passing.